My favorite Hermès boutique on Rive Gauche in Paris. I feel as if I’ve been on a bit of a whirlwind of late, and it’s not simply a result of running a bustling new company but due, in part, to the extensive travel I’ve been doing. 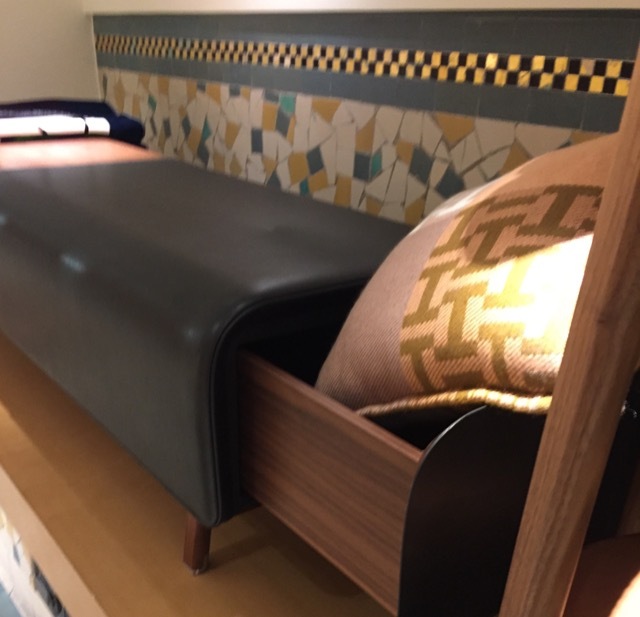 My trip to Paris for Déco Off and Maison & Objet was punctuated by a visit to South Africa where I grew up. I’ll be sharing impressions of both continents in the coming weeks, the inspiration I gleaned from these disparate cultures already making an impact on the designs I’m doing for new furniture releases. Let’s revisit a few style notes from Paris first. There is so much to tell given it was the center of the design and fashion universes for a few weeks last month. 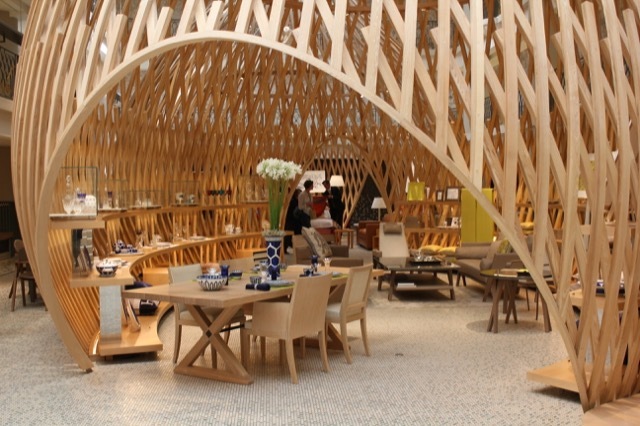 There were furnishings and textile releases aplenty; and there were the requisite jaunts to my favorite shopping venues. When a friend asked me to take him to my favorite Hermès boutique, for instance, I knew exactly where we were heading, as I am particularly fond of the one at 17 Rue de Sèvres near Le Bon Marché. My senses are ignited each time I enter the spacious store, and if you take a peek at the above video that so beautifully captures the atmosphere, I think you’ll see why. The Hotel Lutetia pool was once a gleaming gem of art nouveau/deco architecture. 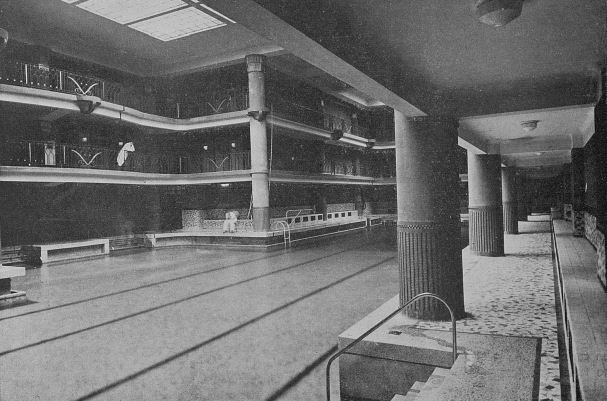 Here is the most surprising thing about this particular shop: it is housed in a former swimming pool, though not just any one—the swimming pool belonging to the Hotel Lutetia, which was a shining example of the segue from art nouveau to art deco sweeping Paris in 1910 when it was built. By the time Hermès decided to nestle itself into the heart of Rive Gauche, this part of the building was a giant empty volume that the RDAI architectural firm transformed to represent the luxury brand, as its team does with all of their boutiques. The transformed interiors of the Lutetia pool hold the Hermès boutique on rue de Sevres. 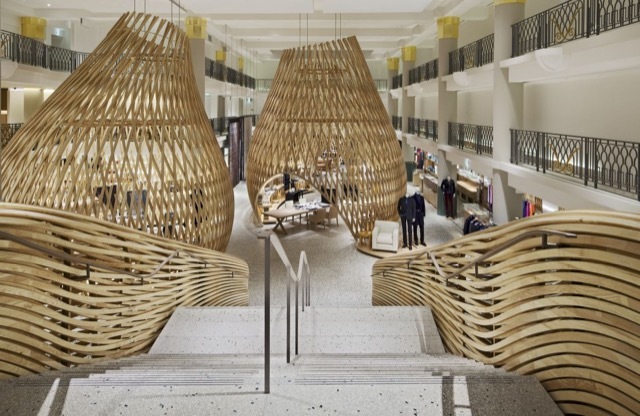 The interior treatments these visionaries achieved are distinctive—just look at the ribcages of wood spiraling up like chic wigwams to bring warmth and a sense of cocooning to what could have been a very unfriendly and cold expanse! It’s somewhat like Frank Lloyd Wright meets Parisian flair if you know what I mean. I also love how they style this particular boutique. There will be a few well-placed crystal vases or throws or pillows representing their stock rather than the march of the thousands that most retailers bombard you with when you’re shopping their products. A tile detail from the Hermès boutique on the Left Bank. You can see their color story clearly within the clean layout of the interiors that meld the art deco railings, the clean-lined concrete shell and the organic shapes in wood. Case in point is this image I took of the tile treatments on the walls in places, the confetti-like arrangement adding slight pops of color and complementing the terrazzo-like surface of the stairs. Patrick Frey presenting at Déco Off in Paris. I noticed a theme in the colors I was seeing there and in other places, such as Alhambra where the walls were covered in a type of woven straw that matched the feel of the patterns on the floor in Hermès. 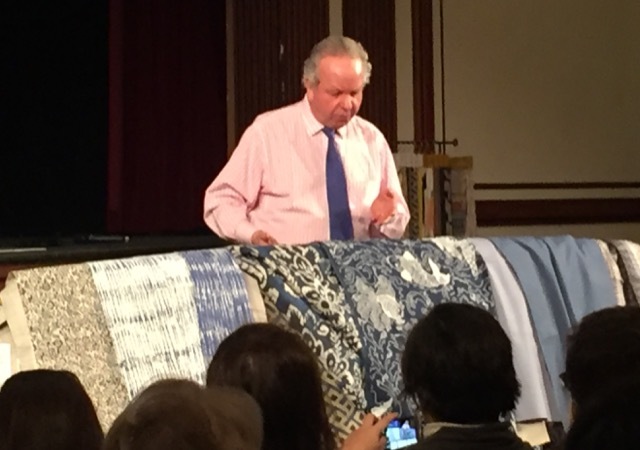 Look at any number of the fabrics Patrick Frey—of the famed Parisian textile house Pierre Frey—is introducing for Déco Off and you’ll see the same textural tactility I’m speaking of. Fermoie upholstery samples for the Azure Collection. 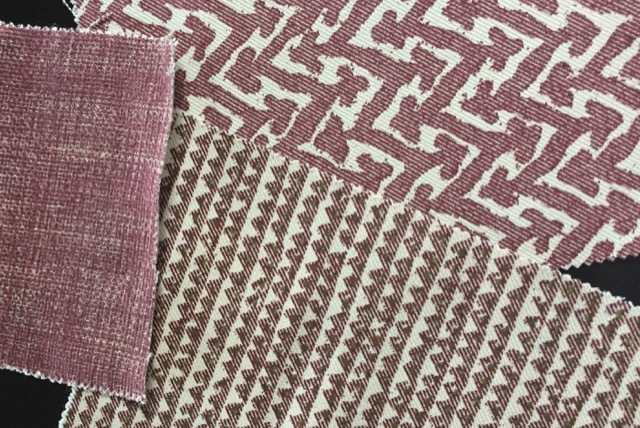 It didn’t take long before I was seeing a similar texture turn up in the upholstery fabrics I’m sourcing from Fermoie for pieces in the Azure Collection that will be in the Dallas showroom of Ellouise Abbott. This level of serendipity is so interesting to me as a designer, and I find that it happens organically when I am traveling the globe taking in different cultures and attending launches of new products. This post, Style Notes from Paris, © Bruce Andrews Design, all rights reserved. Our furniture is now available through Nandina Home in Aiken, SC; Jalan Jalan in Miami, FL; Travis & Company in ADAC in Atlanta; and the Ellouise Abbott showroom in Dallas, TX. We will soon be showing in the Ellouise Abbott showroom in Houston and in the Michael-Cleary showroom in Chicago, IL.